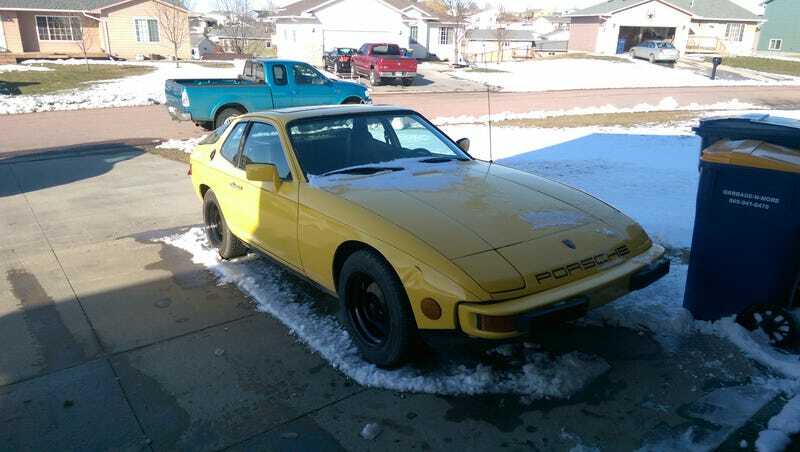 Finally getting around to showing off my newest acquisition, a 1979 Porsche 924. I picked this up last weekend for $1300 and I’m pretty happy with it so far. Admittedly I might have paid a little too much as I’ve found a few more issues that I missed during inspection. Overall it’s a good car, it runs good, and drives straight as an arrow, but it has a bad case of the “high schoolers”. There’s quite a bit of questionable work and shoddy repairs done throughout the car. Most of it is stuff I can handle though and I’ve been plucking away at it for the past week to get it into somewhat acceptable shape. The first main issue I found is the battery tray, which is right over the passenger foot well. It tends to rust out on these and leaks water into the passenger foot well. I knew this going in, and it looked solid, as did the rest of the car, so I didn’t look extremely close. Only after I found wet carpet did I look a bit closer and discover that the tray had indeed rusted out, and was repaired with fiberglass. I don’t really have the means to fix this the “right way” but for now, at least to stop the leaking I’ve covered the spotty fiberglass with Flex-Seal. As you can see from the pictures the outside is a little rough, the paint job is crappy and has over spray everywhere, but it looks decent from a distance and I might paint it anyway. I’ll for sure pop out some of those dents, and clear off the rust and try to match the color as close as I can. I’m going to repaint some of the window trim as well which should really help to make it look a little nicer. The most glaring problem with this car is the interior. On top of the years of use and typical 70's Vinyl, one of the previous owners decided to crudely cut holes in the door for some Walmart special speakers, and they decided to wire them with a combination of speaker wiring, and apparently whatever random wiring they had laying around. Luckily the local junk yard has a pretty fresh 924 (with brown interior) and a 944 (with black) so I should be able to get some good replacements to get the interior better sorted. I’ve already hit it with some soap and water and it’s already cleaning up nice. There’s a whole list of other little things here and there throughout the car. Nothing I cant handle though so this should be a good little project to tinker with as I drive. Edit: I accidentally posted this on LaLD at first, so I moved it over here.